A lot of our customers had asked us if they can add new task types? Good News! Now you can create new task types according to your business requirements while using RepairDesk. This will help you in defining different sorts of repair jobs and work orders. 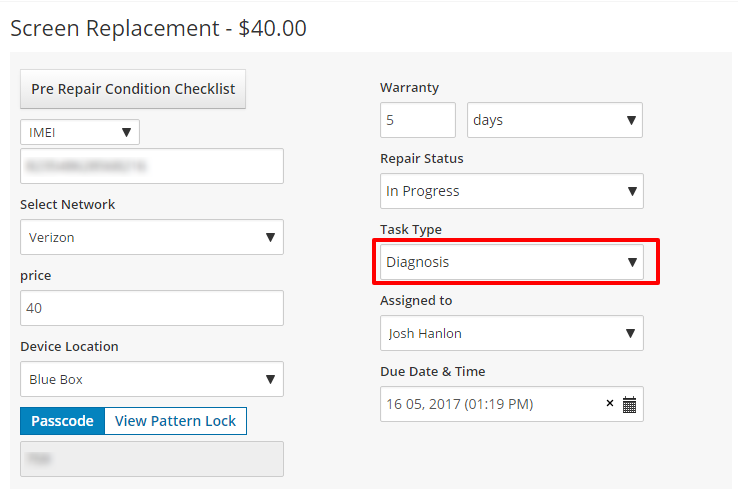 So if it is a field visit or just a diagnosis check, you can mention it on a repair ticket. 1. Go to View all Task Types under Module Configuration section of Settings. 2. On View all Task Types screen you can view default task types. In-Store - In-store repair job. On-Site - Technician visits customer for repair. Pick Up - Collect device from customer. Drop Off - Return device to customer after repair. Out Of Warranty - This service is out of warranty. In Warranty - Repair job taking place within warranty period. To add another task type click on Add Task Type button. 3. Enter name of task type and click on Create to add this new task type. 4. Now while creating a ticket, on Details page you can select the newly added task type. You can also update a task type for a repair ticket. 1. Go to Manage Tickets. 2. Select a ticket for editing. 3. Under Device Details, click on Task Type. 4. From the drop-down select another Task Type. 5. Click on Save Ticket button to preserve changes. Note: If you haven't selected a task type earlier while creating a repair ticket, you can always add it later by opening a repair ticket and selecting a task type as shown above.